The action of investigating something or someone; formal or systematic or research. A formal inquiry or systematic study. Conservators investigate artifacts to study how they deteriorate, to learn about materials and methods of manufacture, and to design appropriate conservation treatment and preventive conservation strategies. Visual examination. Simply looking carefully is the first type of investigation employed by any conservator. Microscopy using different light sources, including reflected, transmitted, and polarized light, can be used to reveal surface details and to identify pigments and fibers. A conservator examines an object visually. Imaging techniques such as x-ray and computed tomography (CT) can be used to look inside objects like mummies and to reveal construction details. 3D scanning can also be used to reveal and document surface details with high precision. An x-radiograph of a mummy. Examination with different wavelengths of light, like infrared and ultraviolet, can reveal faded pigments, modern restorations, and be used to identify certain adhesives, pigments, and other substances. Analytical techniques such as chemical spot tests, x-ray diffraction, x-ray fluorescence, Raman spectroscopy, Fourier transform infrared spectroscopy, and scanning electron microscopy with energy dispersive spectroscopy can be used identify the composition of many different types of materials. Noun: Material that provides official information or evidence or that serves as a record. A conservator documents an object with photography. Documentation is an important step in the conservation process. It creates a record of an artifact’s condition at a particular moment in time. Conservation records can be used to monitor condition changes and to evaluate the long-term success or failure of conservation treatments and preventive conservation strategies. 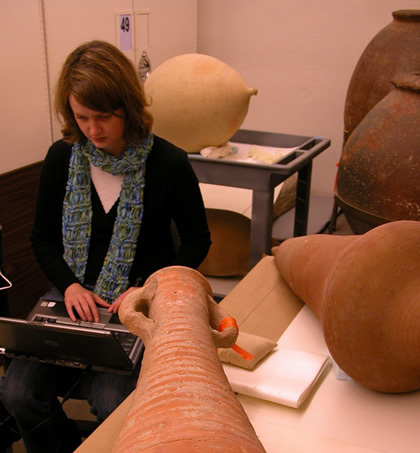 A conservator writes a conservation report for an object. Written conservation records usually include a description of the object, its function, the materials from which it is made, and its method of manufacture. The condition of the artifact is carefully described, and the conservation treatment plan or preventive strategy is laid out. Any actions taken by the conservator, and the conservation materials used in the treatment, must also be noted. 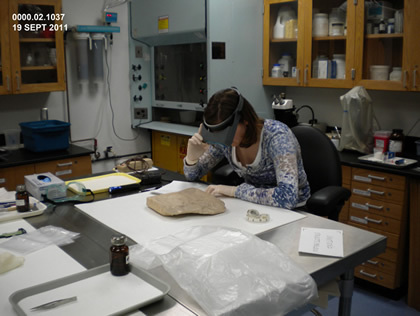 Products of additional investigation, like CT scans or spectra from instrumental analysis, also become part of an artifact’s conservation record. Click here to read the condition report for the mummy pictured below. A conservator and curator work to install a mummy in the first-floor gallery of the Kelsey Museum.